October 27 through Saturday, October 31.
snow boots, snow pants, hats, gloves and more…. Sweet Repeats is fully stocked with all you winter essentials. Winter jackets, snow pants, boots, sweatshirts and warm sweaters. JCrew, Free People, and many more. Opens Wednesdays until 6:00pm. 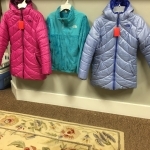 coats, hats, gloves, scarves, boots, Northface, Sorel, and UGG.